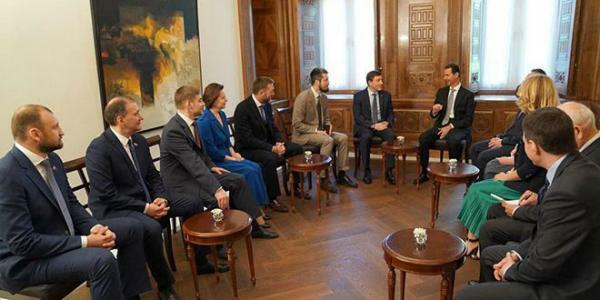 President Bashar al-Assad on Sunday received a delegation from the United Russia ruling political party of the Russian Federation. Talks during the meeting dealt with developments in Syria and the tripartite Western aggression against it, in addition to discussing the historical relations between Syria and Russia and means to boost them in all fields. President al-Assad said the tripartite missile aggression on Syria was accompanied by a campaign of misdirection and lies at the Security Council against Syria and Russia by the countries that carried out the aggression, which proves once again that the two countries are fighting the same battle not only against terrorism, but also to protect international law which is based on respecting the sovereignty of states and the will of their peoples. Regarding bilateral relations, President al-Assad stressed the need to implement executive mechanisms to improve economic cooperation, particularly in the field of reconstruction in Syria, and at the same time pointed out to the importance of the existing parliamentary cooperation between the two countries in international circles, particularly since the world political map is being redefined. For their part, the members of the delegation said that the tripartite aggression is a clear violation of international accords, and it came at a time when the Syrians are working to restore stability and rebuild what was destroyed by terrorism. They affirmed that Russia will remain firm in its support for Syria in the face of the war targeting it. The members also stressed the Russian side’s desire to bolster cooperation with Syria in economy and reconstruction and signing partnerships between cities and provinces in the two countries. The delegation is headed by Deputy Chairman of the Russian Federation Council Andrei Turchak, and it consists of a number of parliamentarians and the Governor of Khanty-Mansi area.